Little Genius Single Pack - a flowpacked flat green foam puzzle cube (with animal symbols). 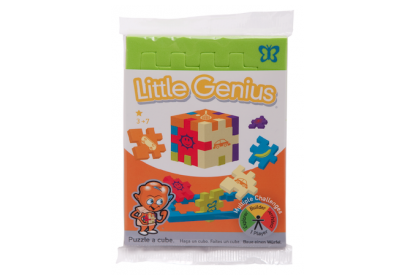 Single foam Little Genius puzzles are individual packed in a flowpack with an instruction card. The concept is explained in a symbolic way. On the instruction card several possible Little Genius puzzle cube combinations are displayed, together with one large construction solution.